Sonic Generations: 20 Years of Sonic Music is a compilation featuring the music from the first zone in most every major Sonic the Hedgehog game between 1994 and 2010. 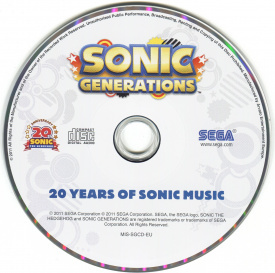 The disc was included in the Collector's Edition of Sonic Generations, which was only available in Europe and Australia. The album contains all the tracks from History of the 1st Stage Original Soundtrack Blue Edition and White Edition, which were preorder bonuses with the Japanese Nintendo 3DS and console/PC versions of Sonic Generations respectively.